We have a Maltese-Shih Tzu cross, a cute white dog with very large appealing eyes, standing just over 12 centimetres high. When he first came to us we named him Bob after his characteristic bouncing gait, but on a longer acquaintance we thought Genghis Khan would have been a better choice. This tiny fellow laid claim to any space he inhabited – sofa, room, street, park – with an imperious stare, and woe betide any dog that happened to look his way. No matter how large, should that dog attempt familiarity, it received a good barking, and if it did not take the hint, a graveyard growl and darting nip at the ankles. As for us, we were simply minions who carried out his will and if he was displeased we were treated to a display of gritted teeth. When the time came for him to be groomed we made an appointment with Melanie King, whose card we had found at the local vet. We were truthful about the Khan’s forbidding temperament but Melanie was unfazed. “No problems,” she said. Nervously I waited at the front door at the appointed time, and when Melanie arrived on a bicycle with a handle-bar basket, I thought, “This is not going to happen.” Smiling cheerily at the Khan, Melanie said with genuine delight, “What a cutie,” and stretched out her arms. I shifted Bob warily in my arms – he is opposed to being disturbed in any way – but Melanie took hold of him with both hands (not a murmur from the master) and placed him in the basket. She rode off, Bob surveying the passing world with all the aplomb of an oriental despot from his palanquin. I felt I had witnessed a miracle. So how did Melanie become a dog-whisperer? While her skill was not inherited from an Irish grandmother with second sight, she did grow up in a family deeply connected with animals as her maternal grandfather loved, bred and trained greyhounds and her father’s parents kept horses. From an early age Melanie showed sympathy for dogs, and her mother struggled with her daughter’s habit of bringing home stray animals. At 20 Melanie bought her first dog, a Pekingese, with whom she became besotted, her love extending to the breed, an ancient variety of toy-dog originating in China. Breeding led to showing and showing to grooming, and Melanie did her training at Parramatta College. She then worked in various grooming salons and for vets, extending her skill sets to include first aid and animal behaviour, and eventually opened her own business in Petersham, aptly named The Dapper Dog. As Melanie points out, the task of the groomer is a complex and demanding one if sensitively carried out. If the animal is a new or infrequent furry client, the groomer needs to establish an almost instantaneous bond of trust so that the animal will be responsive to the groomer’s requests. Groomers who are purely task-oriented are more likely to use restrictive harnesses increasing the dog’s fear and its reluctance to return. As dogs are quick to pick up on human emotions it is important that the handler remains relaxed although working under the pressure of scheduled time slots. Grooming is stressful for dogs. As Melanie says, the dog, cat or even rabbit is often passed over to a complete stranger and subjected to a range of experiences that are, from their perspective, invasive and frightening. Animals are sensitive about certain areas of their bodies, for instance, dogs are reluctant to have their paws handled, bull dogs are 50 per cent likely to be afraid of water, and animals resist being held in positions that make them feel vulnerable. If washed by hand rather than the impersonal hydro-bath, the dogs are more relaxed, and the handler can feel the condition of their skin to detect lumps, sore spots and sensitive joints. Melanie feels that her later studies in natural therapies, including massage and acupuncture, and of herbal medicines, changed her perspective on grooming and she realised the need for a holistic approach to animal care. 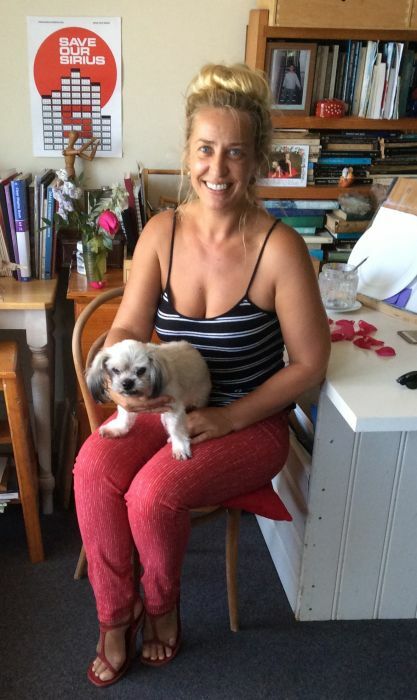 Consequently, she closed The Dapper Dog and opened The Sacred Pad in Waterloo, the name expressing Melanie’s acquired knowledge through experience and study, her affinity for, and intuitive understanding of, our valued animal companions and esteem for natural methods. Melanie now travels around in a neat white van, fresh frangipani flowers along the dashboard, to pick up clients or take her furry boarders to Kurnell beach, and I can walk Bobbie, now 16 but not one whit mellowed, to The Sacred Pad. When a smiling Melanie opens the door to us, there are two or three cheery animals in her wake, but the Khan is pretty relaxed about it. After all, if an emperor must have downtime it is best that it be quality downtime.